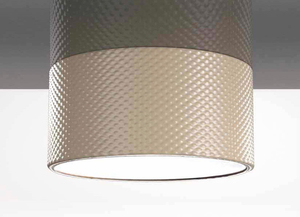 A fixture that can be used as ceiling or wall lamp. Available in three sizes, with a close lenticular shape made of satin white glass with a crystal or topaz rim. ... new one. The concept is also a reminiscence of the process of glass blowing in which the incandescent glass contains the light before it even has a definitive shape. ... decorative graduation of the light from the diffuser. With two diameters and four different installation options, the lights series can be used for a wide range of applications. Breaking symmetries with irregular angles and sides, …our “comet” design. Installing on any surface, vertical, horizontal or sloping. Removable stretching fabric covering a metal frame. Aluminum profile 200 cm long, with trîangular mobile support on the roof. Easy orientation (360°) and height régulation with bare hands. Straight cubical designs for surface suspension & flush fittings. Cubes are a never-ending fashion with any design concept. Metal framework, hand made cord lampshades. ... characteristics has resulted in the development of LOFT. A complete set of fittings available in three sizes with different light sources allowing for diverse applications. A contemporary ceiling lamp may take its inspiration from standard or classic lamp designs while expressing originality through its use of light, color, form or material. It may light an entire area, constitute a centerpiece or create a certain ambiance. Models include suspended and recessed lamps, as well as uplighters. On ArchiExpo, such fixtures are arranged by properties including material, fitting or bulb type (e.g., fluorescent). These lights are found in domestic and commercial settings, either individually or as part of a series. Configuration may vary with use. For example, a grid of lights may be installed to evenly illuminate an entire kitchen. A dining room pendant light can constitute a focal point and create a particular ambiance. Some models are adjustable or even programmable. Consider how lamp style will affect the space as a whole. Lighting can be designed to illuminate a large area or just part of a room, or to target specific objects. Ensure that the ceiling can support the weight of the light and that the correct fasteners are used. Evaluate maintenance needs, keeping in mind that upkeep on a series of lights will be more time consuming and expensive than on a single fixturte.